Everyone wants to own Bitcoin, and that’s because it’s rare. Moreover, its rarity is glorified when you inquire how many bitcoins there are and how many we are left with today. Left with because some of the coins have also been lost due to various reasons. The idea behind writing this article is also to discuss those reasons, but before that, let’s find out how many bitcoins actually exist. In reality, the actual maximum number of bitcoins that can ever be in supply is 21 million coins, and this supply is governed strictly by maths, built into the protocol by Satoshi Nakamoto himself. And that is why Bitcoin’s supply is finite, and there will only ever be 21 million bitcoins emitted by the protocol. But 21 million is the maximum cap which is yet not fully mined and not in circulation. As of now, 17 million coins have been mined and the total coin supply halves every four years. Due to this, the last bitcoin will be mined in the year 2140 and after that, no new bitcoins can be mined as per the Bitcoin protocol limit. But the catch here is, not all 17 million coins are actively available to trade because quite a decent number has also been lost too. So, in reality, we are not left with all 17 million bitcoins that have been mined so far. How Many Bitcoins Are We Left With? Due to the rarity and limited supply of Bitcoin, everyone who is part of the cryptosphere remains excited about the number of bitcoins that have been mined and also lost. According to a recent study by Chainalysis, a blockchain analysis company that specializes in building trust in blockchains, reported that around 4 million bitcoins are lost an d are irretrievable. Hence, they are not in circulation and are just sitting on the actual numbers. In reality, out of 17 million mined bitcoins, we are left with only 13 million coins. And this accounts for lost coins due to lost private keys, Satoshi’s locked coins, and due to the HODLer’s death. There are some other factors too, that can lead to loss of bitcoins, but we will discuss those in the next section. How Many Bitcoins Are Yet To Be Mined? 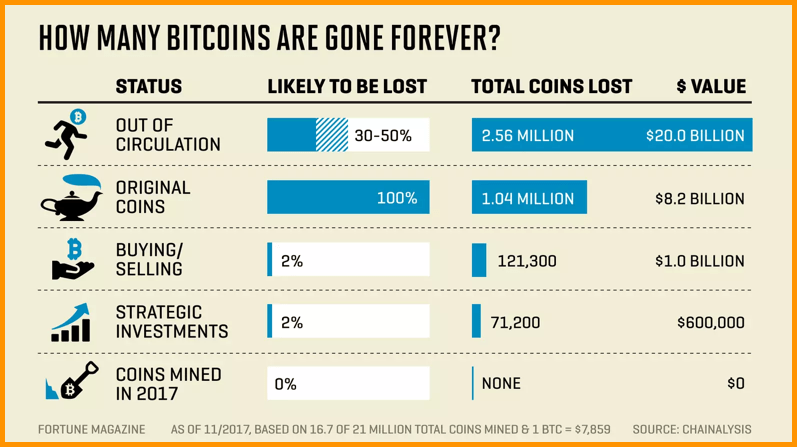 The fun fact is, even though so many million bitcoins are lost, there are still close to 4 million coins that are yet to be mined, and that over a period of over 100 years. Considering there have been so many coins lost in the past, it is only wise to think that more coins will be lost in the future – from the 4 million yet to be mined, and from the 13 million currently in circulation. But the rate of loss of coins will significantly decrease because investors are becoming more mature and each BTC bears a decent price tag. Having said that, have you ever wondered what happens to the lost coins? Well, lost coins stay on the Bitcoin address forever as it’s their keys that are lost. In this case, no one owns those coins, and it remains unclaimed on the network itself. On the other hand, technical incompetency shown by a Coinbase-like exchange is another reason for the lost bitcoins. Last December, it was found that Coinbase had one wallet containing 265 BTC with 1.5 million UTXOs. The cost of transaction fee estimated in a consolidation of these UTXOs is higher than the number of coins itself, which is a bizarre example of poor technical competency in managing Bitcoin transactions.